How do you play Overwatch on Steam? Or Battlefield 1 or League of Legends, for that matter? There are plenty of PC games that aren’t on Steam, but that doesn’t mean you can’t play them using Valve’s client. You just need to add them to your Steam Library. Doing this is really simple. In the bottom left corner of the Steam client is an Add a Game button. 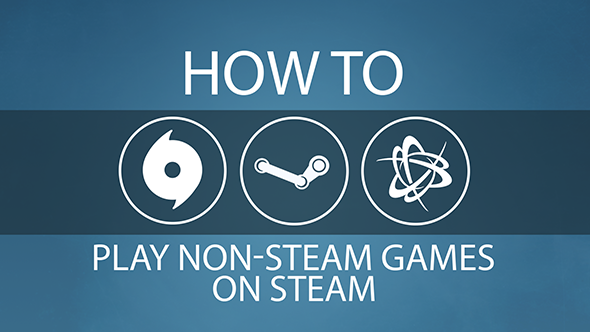 Click this, and select Add a Non-Steam Game. A new window will open up with a file browser. You need to find the .exe file of the game you want to add. These are normally easy to find because they have the game logo as the file icon. Steam will offer suggestions of games it has found, but if the one you want is not in the list simply look for the game’s install folder using the ‘browse’ button. When you’ve found a game, click the tick box next to its icon in the list and then press the Add Selected Programs button. This will add the game to your library list in the Steam client. If the .exe has a strange name and you’d like the library to display a nicer one so everything looks uniform, just right click the game in the library and change its name in the properties window. In this folder will be all the Origin games you have installed. So for example if you wanted to add Titanfall 2, you’d go to C:\Program Files (x86)\Origin Games\Titanfall2 and add the Titanfall2 file. This will add the game to the Steam library page. Despite adding an Origin game to Steam, you will still need to have Origin running for the game to work. You will notice that there is a Battle.net folder in Program Files, but your Blizzard games are not stored there. They each have their own folder, so seek them out instead. For Blizzard games to work in Steam the Battle.net client will still need to be running. Launching a Blizzard game should open Battle.net automatically though, so your new Steam shortcut should work just fine. From here you should be able to find the folder of the Uplay game you’d like to add to Steam, and select the .exe application file from there.